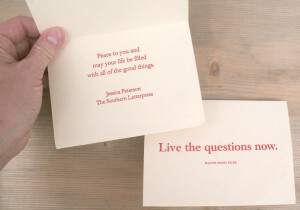 Order your letterpress-printed holiday cards today! Mark the end of the year or holiday season with a message of gratitude to your friends, family, clients and customers. Send a card that won’t end up in the recycling box… a piece of personalized, letterpress-printed artwork. Witty,poignant and beautiful, these cards will be printed with a phrase that reflects your personality. One color, printed on 100% cotton Lettra paper. The cards are folded, with the message of your choice printed on the outside, blank inside. White or colored envelope included. Two sizes available: 5 x 7 inches or 4.25 x 5.5 inches. (More options available for an additional charge).